I think if I was getting married again I would love a Christmas theme wedding. The twinkle lights and beautiful decorated trees I think would be a very romantic. I would walk down the isle to Carol of the Bells. One of my Christmas favorites. 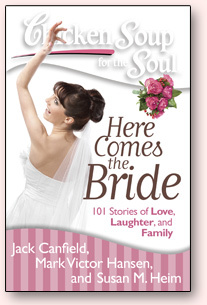 This book give you some great stories of brides around the world’s big day. Maybe it will inspire you with your upcoming wedding. The wedding day, and each day leading up to it, is a special and exciting time. In this collection of 101 heartwarming and hilarious stories, brides and grooms, families and friends share their memories of the big day. With stories about everything from the proposal, to the planning, to actual wedding day events, the honeymoon, and all the joys and frustrations in between, this book will delight and encourage any bride or newlywed. A great gift for bridal showers, engagements, and weddings! I found this giveaway on your site, after getting to your site from a twitter tweet. It was on my OLS page. In Response To Your Question Of How did you hear about this giveaway? I heard about it from online-sweepstakes.